It's a busy time of year, but I'll steal a few minutes to say hello to everyone and let you now I'm still kick'n. I've added Perth to my list of Temple Districts Using New FamilySearch. In a previous life I built a development organization that released simultaneously in a half-dozen languages, including Japanese. It adds to the cost and date of the English release, but decreases the overall cost and shortens the overall schedule. 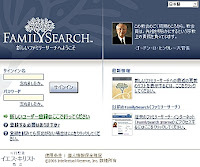 FamilySearch seems to have taken a similar approach to the development of the New FamilySearch (NFS) website. This type of process would seem to be ideal for the international needs of FamilySearch owner, the Church of Jesus Christ of Latter-day Saints (the Church). The website currently supports German, English, Spanish, French, Portuguese, traditional Chinese, Japanese and Korean. Whether behind-the-scenes pieces of New FamilySearch have followed this same approach is hard to tell. The actual rollout to temple districts has first verified English, where the majority of temple work occurs, followed by Spanish, which has or soon will become the predominant language of Church members. A spokesperson for FamilySearch revealed that rollout to a temple in Japan will come soon.This is great news. Verifying that all the behind-the-scenes pieces of NFS work for a 16-bit language is a major milestone. Japanese is one of the world languages that have more letters or symbols than will fit in the 256 different combinations possible in the 8-bits of one byte. To implement Japanese, Chinese, Korean and other languages with large sets of written symbols, one must use 16-bit characters or double byte characters (a mixture of 8- and 16-bit characters). As if to maintain the ying and yang balance of the universe, the spokesperson also informed me that the New FamilySearch (NFS) rollout schedule is lagging a bit. Utah likely won't see it until later in 2008.